Beautiful Darkness got under my skin whether I wanted it to or not. The physical experience of having the book sort of mimicked my reading experience. To start with, I did not buy this book–it was sent to me by a friend who wished for me to bring it home for her from San Diego, where I was immersed in the Clarion Writers Workshop and thus, had very little time to read work that wasn’t that of my classmates. One of my roommates, the awesome horror writer Haralambi Markov, saw it and asked to borrow it for a while. When I happened upon him in our living room later on and asked him how the book was, he said that it was disturbing–this, coming from the guy who wrote a tender family story with baking a dead person into a cake at its center. He showed me the page where the little people start pouring out of a dead girl, survivors of their world turning to jelly and crumbling. So I left it on the living room table up until the day I had to play tetris with two balikbayan boxes before going home. The second approval point: Kerascoët’s lush watercolors and the two different art styles–highly stylized for the little people and realistic for the two humans. They do nothing fancy with the panels or the lettering, and I must say it was disconcerting not to have any lettered onomatopoeias tearing across the page. But simplicity is one of this comic’s key elements; without it, it wouldn’t work half so well. Beautiful Darkness‘s startling layers of complexity must be allowed to speak for themselves, so the art had to scale back the usual ostentatious dynamism that graphic novels are often told in. The Kerascoët duo’s art style was perfect for this project. Beautiful Darkness opens in a fairy tale-esque manner, with the protagonist Aurora preparing for the arrival of Prince Hector with her friend Plim after a ball. Soon after the Prince arrives and pays his compliments, the room they stand in begins disintegrating. Aurora escapes what looks like the end of the world and the “camera” pulls back, revealing that many others like her are escaping, too–from the body of a dead little girl lying in the woods. Soon after, Aurora and the survivors attempt to make some semblance of the civilization in the big wilderness surrounding them and the corpse, even if some actions include what were once mundane activities becoming completely nonsensical out of context–for example, the vain and cruel Zellie having a wedding dress made around her body for about half the book. Others try to find new ways to get food and survive in general, such as climbing into a bird’s nest and getting their throat punctured as the bird feeds them bugs, or eating fruits that turn out to be poisonous (these have killed off scores of the other survivors in no time, apparently). Death is everywhere, but it comes to the nicest and most civilized of the little people first. And there’s the other disturbing element of Beautiful Darkness: death is rampant, even gruesome, but none of the little people seem to care when someone they once knew dies. Life goes on in the dystopia in the woods–there are tea parties and dinners and kite flying, even a wedding. Nobody once says “it’s kill or be killed” or “every body for themselves” at any one point, but that’s exactly the kind of mentality going on here. It is also a tale of the death of innocence (the dead girl is one layer) and of civilization crumbling. Aurora’s helpful, friendly, hospitable nature (the one that allowed her to distribute food, help build shelters, and try to draw people like the shy Timothy into the bigger circle) disintegrates slowly, beginning with her ruinous dinner with the forest animals that inevitably leaves many of her people dead and the food scattered. She even gouges out the eyes of the nice mouse who often gave her berries to eat over uncivilized behavior at the dinner table (it peed on the said table, which was just the mouse being true to its animalistic nature). At the same time, the population of survivors dwindles due to individual stupidity or group callousness (the aforementioned Timothy is buried alive by the snobbish Zellie and her handmaidens, the baby she was caring for left to die on a root even after one of the handmaidens take it from Timothy and coo over it as if it were a toy). There is plenty of backstory left out of the comic: we do not know what life was like for any of the little people before their host body died, for example–certainly, no one spends their time reflecting on what they lost; they just go on trying to replicate it all, whittled down to their most basic images, often with catastrophic results. We do not know how the host body died or why, although it is implied that her death was violent and caused by the adult man living by himself in a cabin–“the giant in the woods.” And we definitely do not know why there was an entire country of little people living in a little girl–and it’s all right that we don’t know the answers to any of these mysteries. 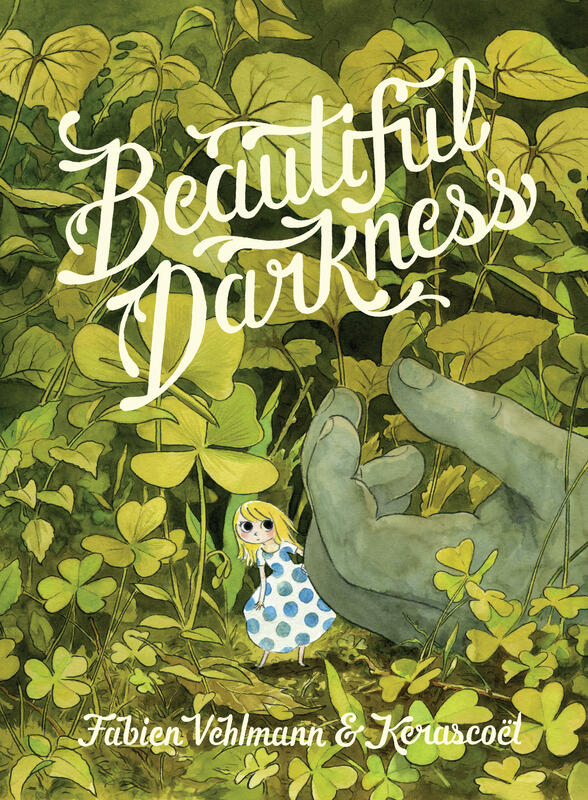 But at its core, when you push aside the tales of surviving a dystopia and the horrors of the human experience, Beautiful Darkness is a fairy tale about what one plucky young woman has to do to win her prince. And even this simple formula, it subverts. The verdict: Beautiful Darkness was adorable. It was disturbing. It gave me goosebumps–Lord of the Flies with a thick layer of sugar and icing on top. It forced me to categorize the way I liked things, the way I really liked things, and the way some things are not my jam at all and yet I can’t put it down for the life of me. Beautiful Darkness is exactly the third thing I just mentioned. I usually cannot stand horror, but I think the simple but effective art style and the fairy tale tropes (and their subversion) managed to pin me down. And the fact that I can write this long a post dissecting it really says something about it. Beautiful Darkness does not appeal to my personal aesthetics at all, and yet, I feel that it’s set to become a classic among other titles in the same medium. Best of all, it helped break this horrible streak I had ever since coming from the workshop, in which I began to see the strings in published work, whether I liked the piece or not. I had no experience of the sort reading this.